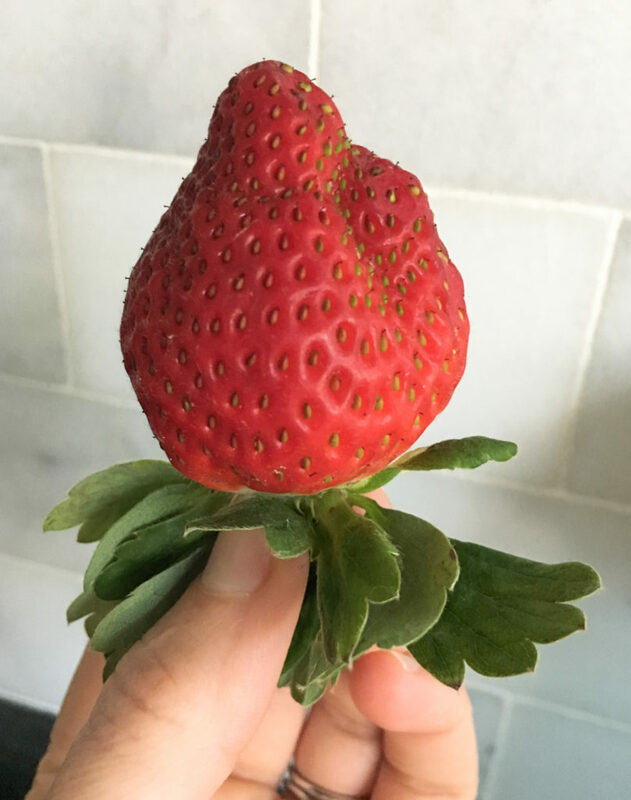 You’ll find beautiful Florida strawberries at any supermarket right now, but I like to head straight to the source: Parkesdale Farms. If you ever watched Strawberry Shortcake in the 80s, this is Strawberryland in real life. 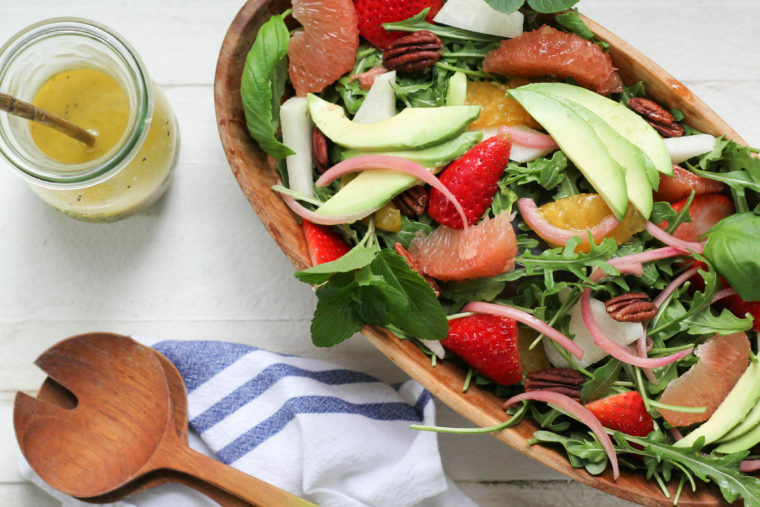 It’s a sunny drive along country roads lined with acres and acres of strawberry fields. Even the air smells like sweet berries. You might find yourself replacing the word “very” with “berry” just like Strawberry Shortcake (or maybe that’s just me). 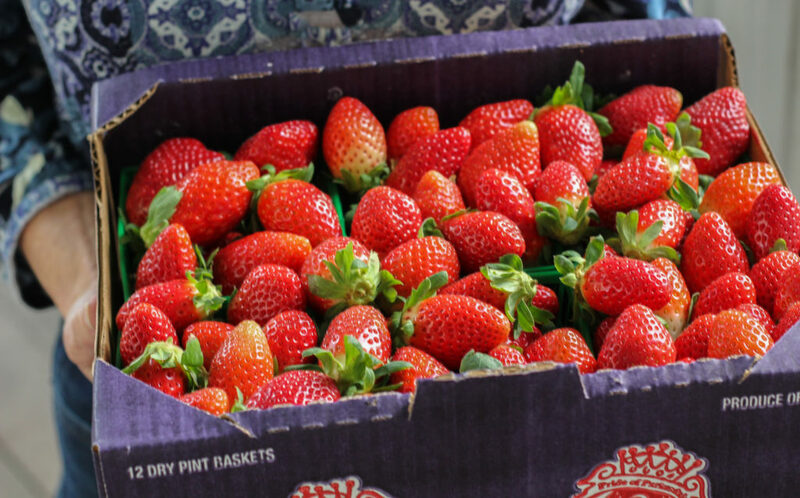 At Parkesdale you’ll find the most gorgeous berries and everything strawberry under the sun. I get a flat of strawberries and a milkshake for the ride home. 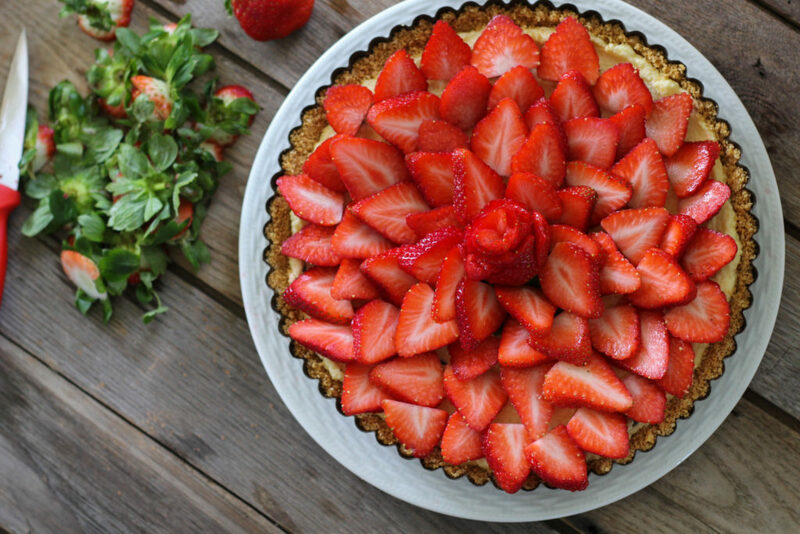 I had big plans for my first flat this season, but those strawberries never saw a recipe or even a knife. I left them on the counter and they were devoured in a few days by everyone who sat in my kitchen. 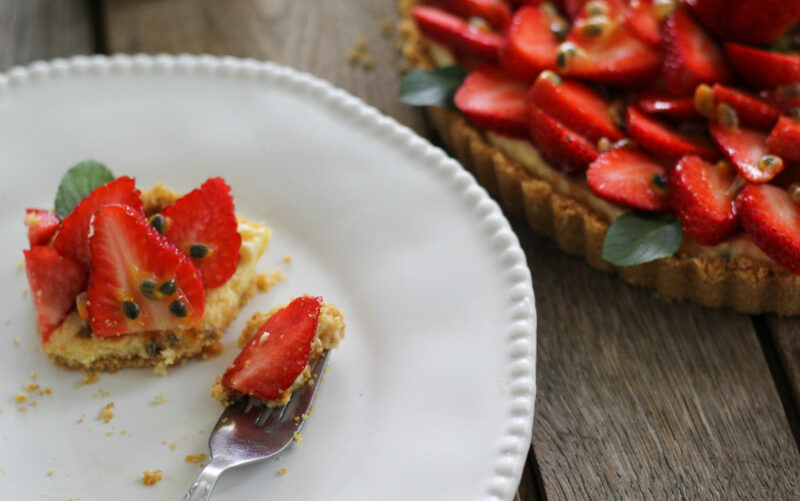 By flat two, I had enough for a recipe, and this tart finally came to life. 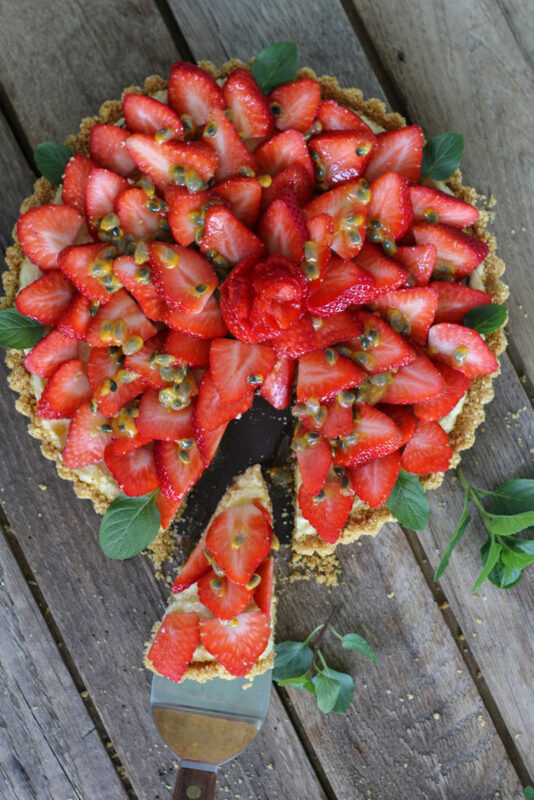 It’s a no-bake graham crust filled with mascarpone and passionfruit, topped with fresh berries and drizzled with passionfruit and honey glaze right before serving. 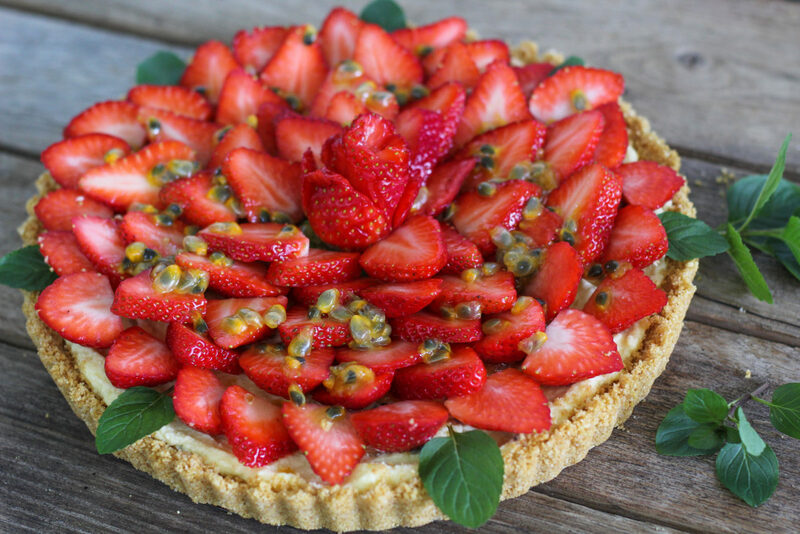 I made something similar last year with Meyer lemons and it was fabulous, but this combination of strawberries and passionfruit knocked my socks off. I swoon over passionfruit. I’m still waiting for the ones on our vine to grow, but I found these babies at Fruitscapes. There’s only a little pulp inside each one, but it packs so much tart tropical flavor. The seeds add a light crunch; totally edible. 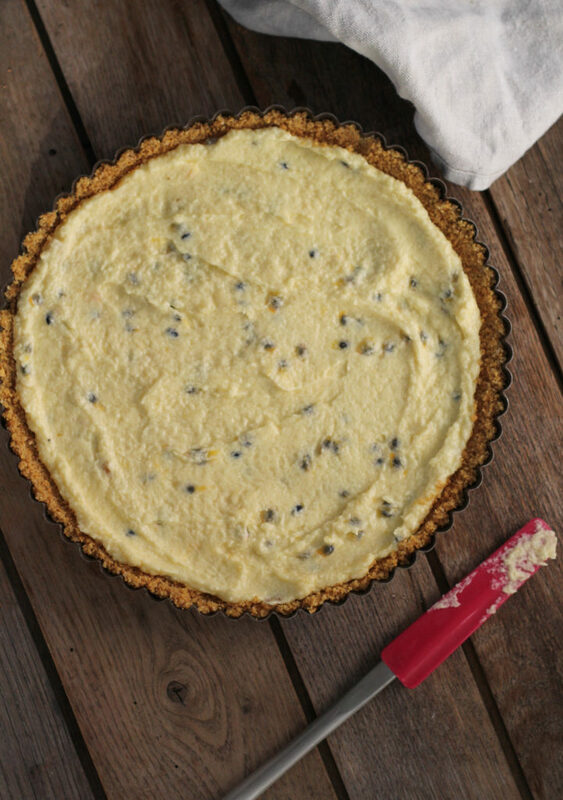 If you can’t get your hands on passionfruit or you don’t care for them, substitute Meyer lemon juice and zest for an equally dreamy tart. 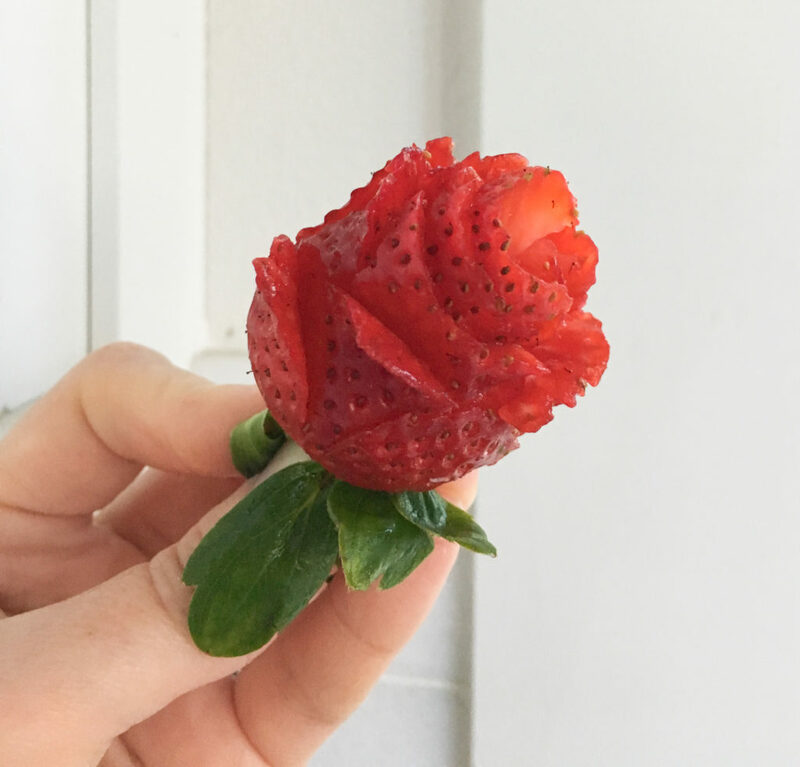 Since it’s Valentine’s Day, let’s make a strawberry rose for on top. 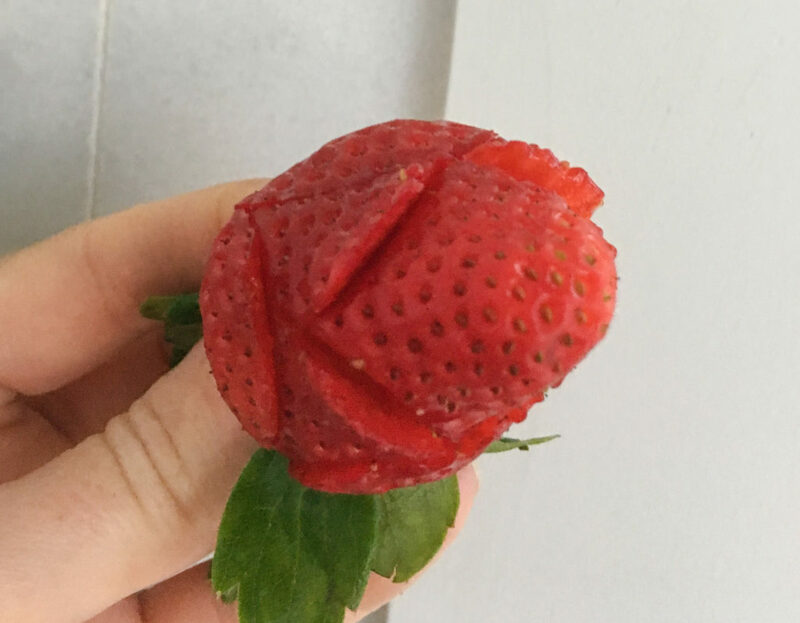 Pick a plump strawberry with a nicely defined point at the end. Hold it by the stem or leaves. Make 4-5 thin slices starting a third of the way down the along the sides of the berry, which will be the first row of petals. Now repeat with another row of petals starting about two-thirds of the way down. Now for the remaining center section, insert your knife along the edge of it and cut a spiral from outside to inside until you reach the very center and a small “plug” is cut out. Gently open up the petals with your knife, and ta-da, a rose! If you screw up, eat it and start over. 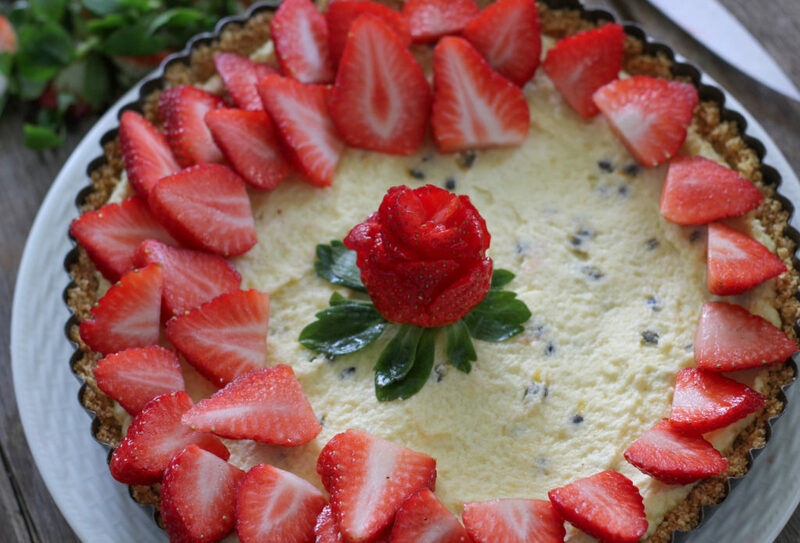 Put it right in the center of the tart, leaves and all, because they help hold it in place. Then make rows of overlapping sliced strawberries. Keep it up until you reach the center. Now it’s ready for a drizzle of passionfruit and honey. Like a field of strawberries on a sunny day. And so berry sweet. Happy Valentine’s Day! Combine the graham cracker crumbs, sugar, cinnamon, and salt in a medium bowl. Drizzle in the melted butter and mix well. Press the mixture in the bottom of a 9-inch tart pan. 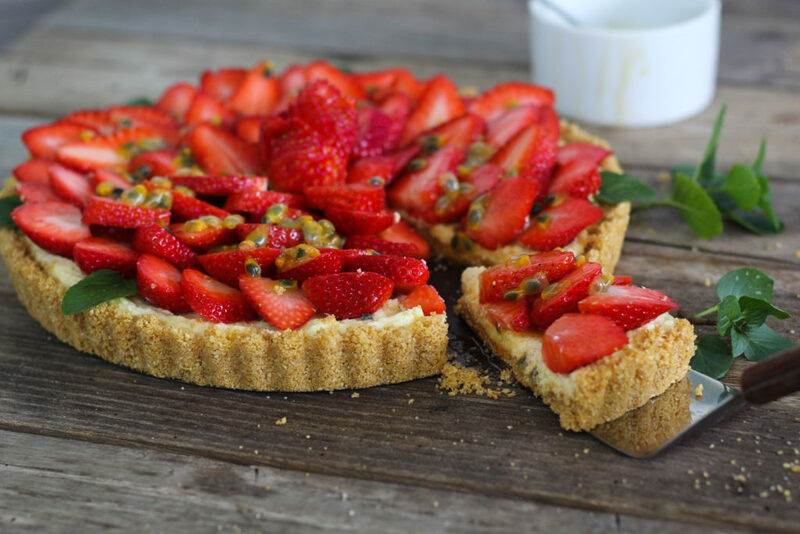 Refrigerate the crust (or bake as directed in the notes below**) while you make the filling and prepare the strawberries. For the filling, whip the mascarpone with the milk or cream in the bowl of an electric mixer or by hand with a whisk until smooth and fluffy. Add powdered sugar, passionfruit pulp, lemon juice, and vanilla until evenly blended. Spread the mixture over the chilled crust. 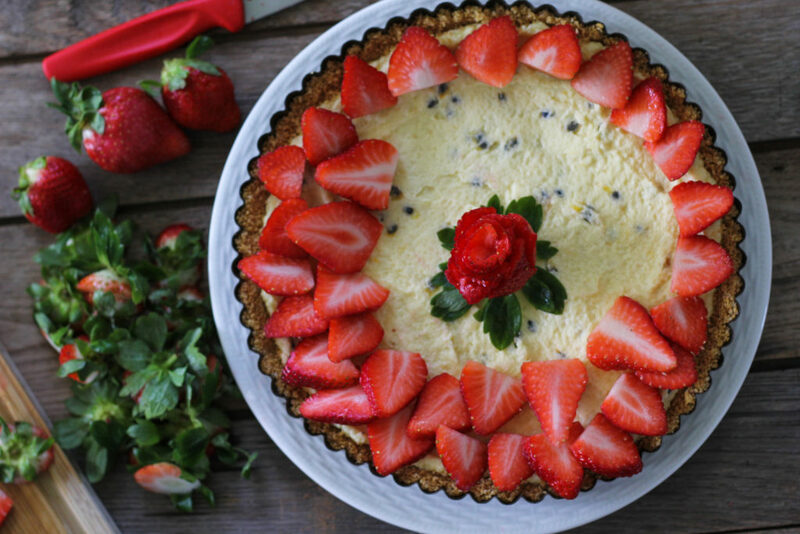 Make a strawberry rose for the center, then slice the remaining strawberries and arrange them over the filling. 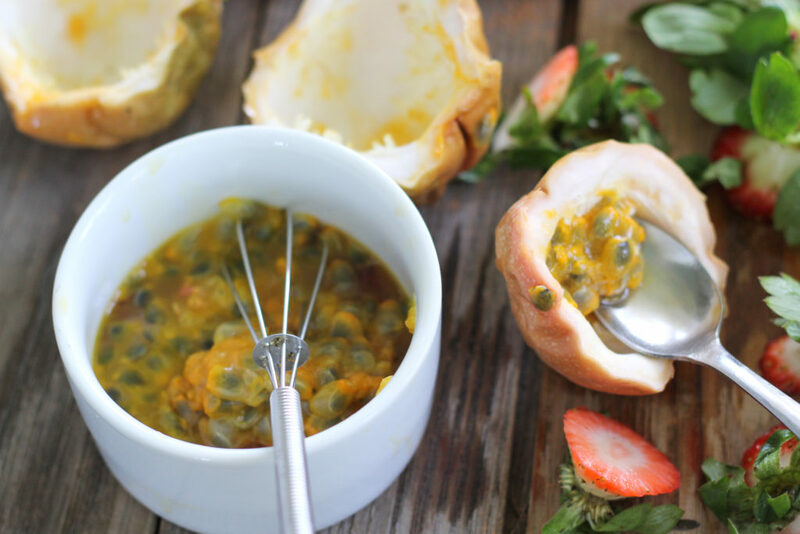 Make the glaze by stirring together the passionfruit pulp and honey. Drizzle over the tart just before serving. Add a few mint leaves if you like. 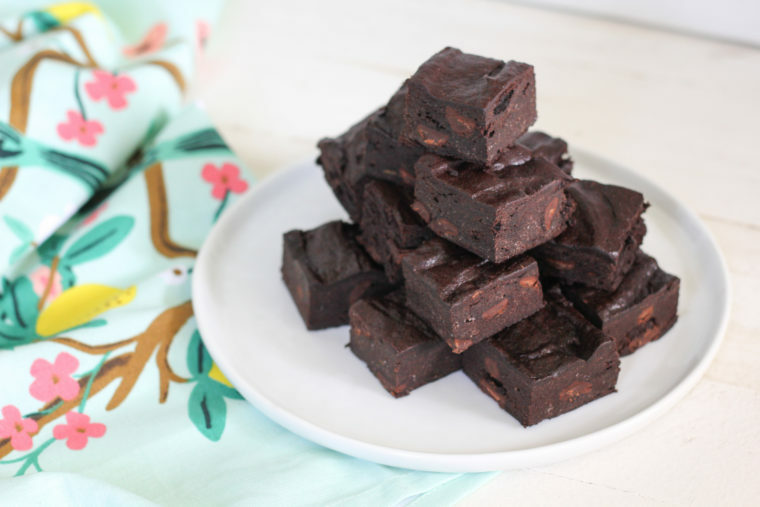 *For a gluten-free option, substitute equal amounts of gluten-free cookie crumbs and/or almond meal. **Alternatively, you can bake the crust at 350 for 6-8 minutes and cool completely. It's a little less crumbly that way and has more toasty flavor. If you're in a hurry, better to chill it. 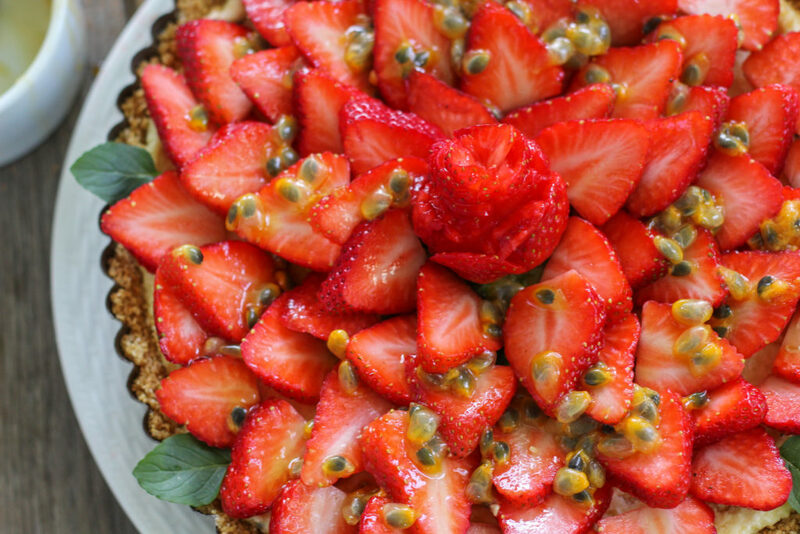 Love the Strawberry Passionfruit Tart 🍓🍓 Thank you for sharing it with us. Very impressive, Danielle! 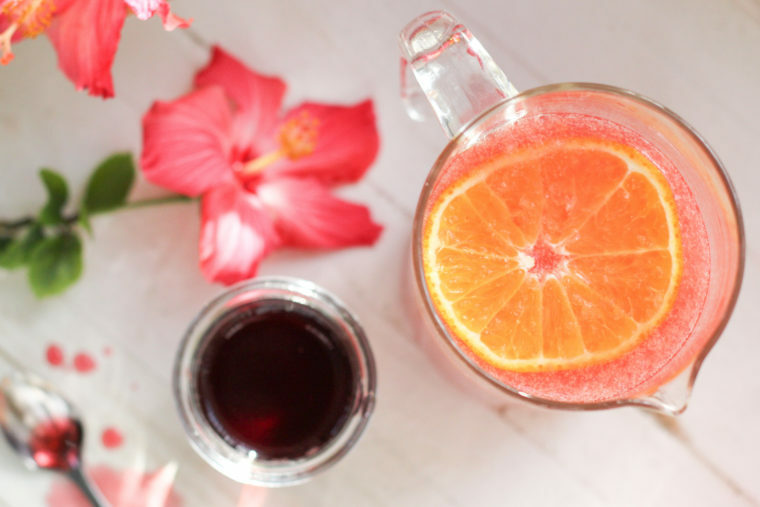 This looks absolutely amazing, and by the ingredients, I know it tastes the same. I think you may be closer to the strawberry farms than me, but this sure makes me want to make the drive, as did your strawberry milkshake post last year! I do love that drive. 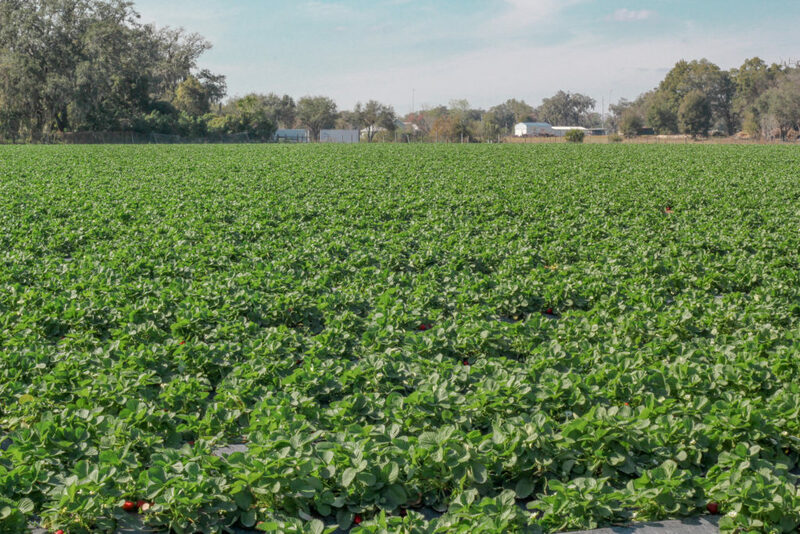 Are there still some u-pick farms west of Ft. Pierce that grow them? I hope you find some good ones. They really are exceptionally sweet this year. I tried to grow my own. Total fail. There is one west of Vero, I believe. I’m not sure about FT. Pierce. Anyway, that wouldn’t be as fun as driving across the state! No doubt, plus those milkshakes!! !